There are two capital region NY institutions that are not in the least fancy. They’re not in the least in great neighborhoods or convenient locations relative to popular landmarks. They don’t even have the best food in the area. But they’re institutions. 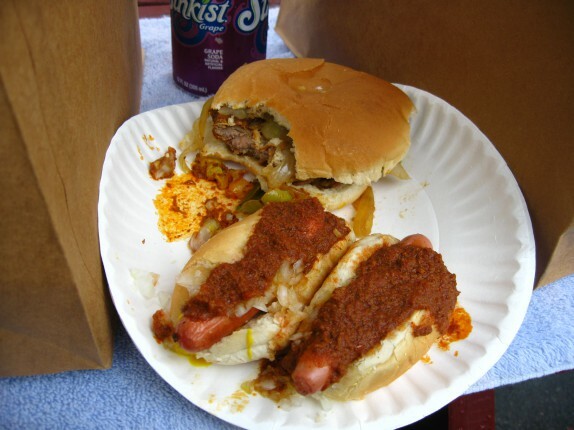 I’m specifically talking about Gus’s Hot Dogs (212 25th Street, Watervliet, NY 12189 or on Yelp!) 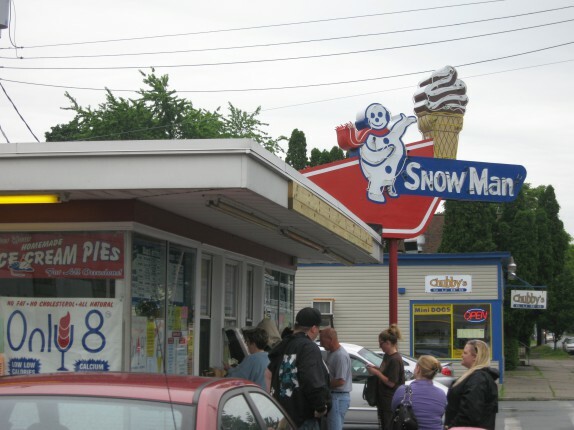 and Snowman Ice Cream (531 5th Avenue, Troy, NY 12182 or on Facebook). Many of us gathered to partake in indulgent eating at both locations this past Saturday, June 11, and even foodies, Daniel B., proprietor of FUSSYlittleBLOG and Albany Jane of Albany Eats! as well as Ashley C. of the nationally acclaimed Big Flavors from a Tiny Kitchen, joined the fun. But these are places where being a foodie like Daniel, A.J., and Ashley or being someone who over-appreciates food like myself gets you nowhere. At these places, you put your pride aside and you just eat. A few weeks ago, Daniel B. started some buzz in my brain about a certain sausage sandwich at Gus’s. It’s honestly an item that I had no idea was even on the menu. To my amazement, upon visiting Gus’s on June 11 with Daniel B., this sausage sandwich is heavily advertised all over the walls, and I felt like an idiot. The sausage sandwich was my reason for choosing Gus’s as the venue for the party. The parking situation at Gus’s isn’t great. It’s street parking, but I’ve never had any issues finding somewhere to put my car. Whatever, it’s not like you’re gonna leave the car there for a long time anyway; it’s just hot dogs. When I got to Gus’s, I ordered 2 hot dogs with the works and a sausage sandwich. I remembered to take a picture but not before taking a humongous bite of the sausage sandwich. Also, the guy who took my order literally threw my change into my hand. Metalfrog was an eyewitness. I’ve talked about the hot dogs a few times before, but I’ll reiterate my perception here. The bun they use is a very fluffy and tasty roll. I’ve never done this, but I’d say on a cross-sectional cut of a hot dog, the bun:dog ratio is 3:1, which is a great ratio when you have a tasty white roll. The hot dog has a great snap and tastes, well, like a hot dog. I like that they’re small dogs because, for me, the best part of eating a hot dog is that snap, and that snap is lost when the hot dog itself is too meaty. When you get a dog with the works like I did, they add mustard, your run of the mill stuff, diced onions, of which they use a fairly mild onion, and meat sauce. Their meat sauce is interesting, and I am convinced that the quality of the meat sauce or possibly the ability to taste is dependent on the season. When Daniel B. and I partook in Le Tour de Hot Dog, it was much colder out, and many of us complained that the meat sauce was very heavy in uncooked spice. This past Saturday, exactly 6 months later, the meat sauce came together much nicer. The hot dogs were good. The sausage sandwich was unique. My family is from Bensonhurst, and my father makes sausage for a living so, to be completely honest, Gus’s sausage sandwich can’t even hold a candle to a real sausige and peppiz hero, but, as a capital district food, it is good. They grill the sausage patty on the flat top, and, just as if I were cooking it, they take it well passed the cooked stage into the well caramelized stage. They add sauteed peppers and onions and put it on a stock hamburger roll. The peppers are cut too large for my liking, so I picked them off, and the onions are barely caramelized and just soft, but enjoyable. However, barring that, I’d say that for a couple of bucks, it’s a deal and a great junk food. Of course, I washed everything down with the obligatory grape soda, the drink that is now the official drink of the mini hot dog experience. 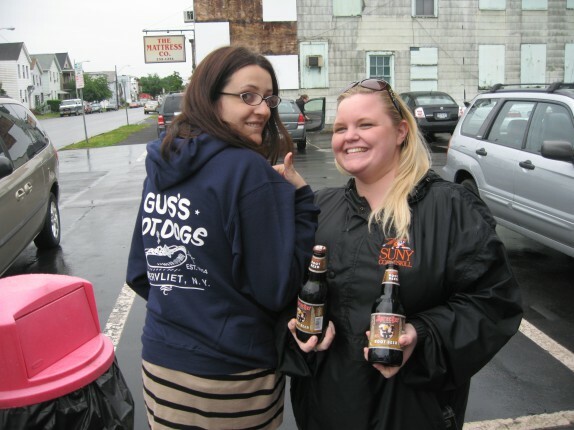 Ashley of Big Flavors from a Tiny Kitchen decided that Gus’s was so great, she needed to represent them! The party moved from savory to sweet when we hopped into our respective cars and headed to Snowman for ice cream. Snowman is an interesting place. It’s in north Troy, pretty much in the middle of the ghetto. They have a parking lot with barely any room to maneuver in it, and they really don’t have any place to sit and eat unless you count the 3 picnic tables pushed against the building behind it. You either eat in your car, or you stand around the place and eat. The latter was kind of tough because it had started to rain, but we did it anyway, all 13+ of us. I don’t want to get cute and creative here, because what do you say about what I described? You can’t say anything. 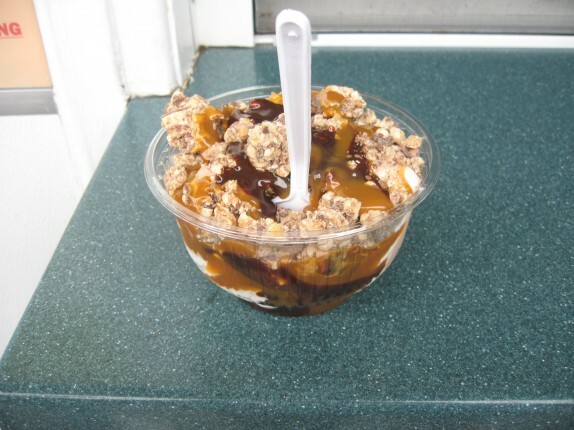 Ice cream, hot fudge, caramel, Snickers bars, $5 bucks, mega quantities; it speaks for itself. I am always intrigued by the Boston shake that they have on the menu. It’s basically a milkshake with a scoop of ice cream, hot fudge, whipped cream, and a cherry on top. A small is like $5 and a large is like $8. I tried to get someone to order a large, but everyone wussed out. One guy, Keith, ordered a small, and it looked insane! After we all finished our ice cream, we stood around talking for a far longer time than anyone who worked there cared to put up with us. Actually, while we were standing there, they put the tip jar out, and I did the right thing just for inconveniencing these kids with my large group. Going to Gus’s and Snowman were the two activities that made up the 1 year of derryX extravaganza, and I couldn’t have asked for better venues. These are two capital region staples that everyone should try. Seriously. Funny story: when I woke up on Saturday morning, it was pouring rain. I announced that I would possibly have had to change the venue. Early comments from Dan Schiller, co-host of MANVille, Albany’s #1 podcast, had me feeling really bad, because he indicated that he was so pumped about Gus’s that he was looking up pictures all night the night before. Truth be told, I had no idea where I would have moved it to, but I was considering Red Front Pizza or, ahem, Dinosaur BBQ, but I think when they saw this, they would have thrown us out. It was a most excellent way to end the day for me. I might have to go back this weekend. My milkshake (the third of my weekend at that point – ahem) was the best I’ve had in a while. 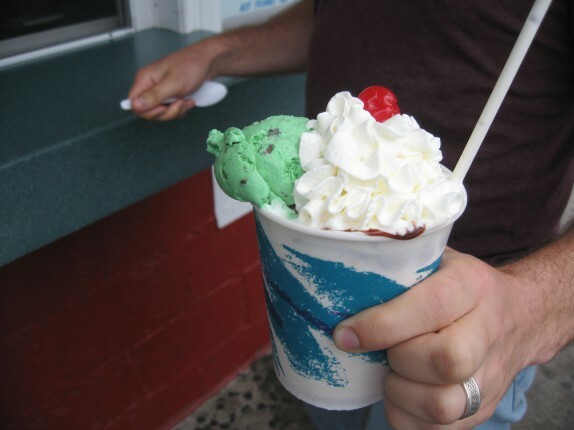 I am so getting that Boston Shake the next time I go. Thanks again for inviting me! ooh damn! i should have gone for a milkshake! the thought didn’t even cross my mind for some reason. To be entirely fair, you handed him incredibly wrong change, so I would have thrown it back at you in the same situation. I would like a redo of both places. I was so sick right up until Saturday morning and all I could stomach was a sausage sandwich. I didn’t even order at Snowman. But I did have a great time. And I will be back for wieners and cream. That was such a good time! I’m pretty sure I could have eaten a limitless amount of mini weenies, if given the opportunity. Happy blogoversary!